We can restore your property and your peace of mind with our fire damage restoration services in Illinois. Fire damage can render your home or business unsafe and unusable, so it's important to get help on-site as soon as possible. 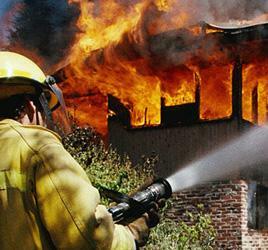 Fire damage restoration and smoke removal is a complex task that should only be performed by a professional restoration company. Our staff has helped many families and property owners throughout Illinois with all of their fire damage restoration needs, and we can help reduce your stress as much as possible! At Illinois Water & Fire Restoration, we offer free estimates for homeowners and property managers interested in restoring their fire-damaged home or business. Each estimate includes a written quote, a professional inspection, and an on-site consultation where we address any questions you may have. Call us to get a quote in Joliet, Plainfield, Naperville, Bolingbrook, Romeoville, Mokena, Homer Glen, Frankfort, Shorewood, New Lenox, Aurora and surrounding areas in Chicagoland. Homeowners and business owners are often anxious to begin the restoration process immediately after the fire has been eliminated. However, it's essential to seek professional advice to ensure there is no further damage to the structure. Even once the fire is out, the fire damage continues because a good portion of the material found in your furniture and flooring is synthetic. When burned, synthetics create a variety of complex chemical reactions and within a few days, these items can go from restorable to unsalvageable. At Illinois Water & Fire Restoration, our disaster restoration professionals are experts in understanding the chemical combinations that can effectively restore and salvage belongings. We even remove smoke and soot from at-risk items such as brass, aluminum, chrome, marble, tile, and porcelain, as well as fabrics in carpets and upholstery. By calling Illinois Water & Fire Restoration, you can prevent additional expenses, eliminate odors, and save your carpets, floors, and priceless items from future disaster restoration damages. At Illinois Water & Fire Restoration, our 24-hour emergency fire restoration service is available every day of the year. This ensures that we'll be on-site when you need us, helping you restore your structure quickly and competently. We also offer board-up services to secure the building and keep out unwanted intruders. Give us a call at (630) 537-0276 or contact us online for a free estimate. For 24-hour emergency service contact us today!